Following Patricia’s unexpected death on Feb. 2, 2017, the jazz community, friends, and family will join together to honor Patricia and her decades of tireless commitment to Arizona jazz. The day will feature outstanding music, including performances by Lewis Nash, Charles Lewis, Francine Reed, Dennis Rowland, Joel Robin, Beth Lederman, Judy Roberts, Alice Tatum, Delphine Cortez, and many other top Valley musicians. Food and drink will be served. RSVP via email to RSVP@ASUKERR.com or at 480-596-2660. In lieu of flowers, donations are being accepted to the Patricia Myers Young Sounds Scholarship fund at www.youngsounds.org/donate and at the event. 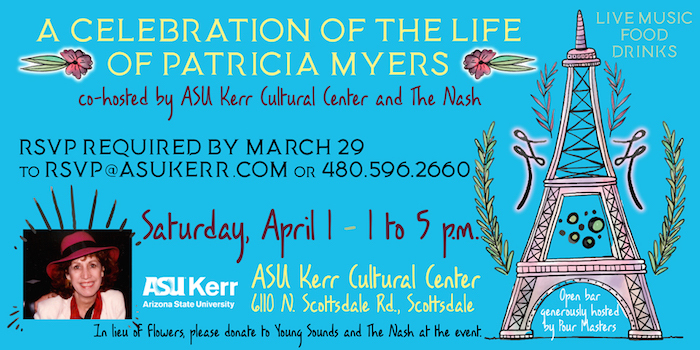 Patricia Myers devoted her life to promoting and nurturing the Phoenix jazz community as both a journalist and a producer of events. She began a regular jazz column in 1970, published then in the Scottsdale Daily Progress, and in 1977 co-founded the non-profit organization Jazz in Arizona. Myers’ column continued through to 2017, at MusicSceneAZ.com, which featured her monthly jazz updates: her Riffs column, Events Calendar, and Jazz Venues. The website was conceived and is sponsored by the 103-year-old Phoenix Musicians Union, Local 586. It compiled all genres of music events throughout the state, with a special focus on local live jazz and The Young Sounds of Arizona’s two high-school honor jazz bands.